STUDENT–Centered LearningÂ (SCL) is one of the most popular teaching approaches among education experts across different countries in the world. SCL is believed to be very effective in enhancing teaching learning processes intended to optimally improve studentsâ€™ outcome. This approach corresponds to the philosophy of learning that views learning as an opportunity to get more knowledge for the purpose of improving the quality of life. In addition, SCL is in line with a learning approach developed by cognitive psychology, which considers that the more knowledgeable students are, the better they can explore new learning sources, either on their own or with their peers. Attard et al. (2010)fromÂ Education InternationalÂ (EI) andÂ European Studentsâ€™ UnionÂ think that the best teaching and learning process involves students to actively dig learning materials. At the same time, lecturers are expected to facilitate and create learning opportunities for students, for example, through assigning students to conduct research, present materials, discuss certain issues with their peers, and draw conclusion based on their discussion. Furthermore, Attard et al. (2010) differentiate studentsâ€™ outcome based on various teaching approach as described in the following diagram. 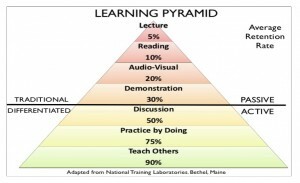 It can be seen from the diagram that learning through a passive model of learning, such as through lecture, reading, audio-visual, and demonstration can only result in a maximum of 30% of the learning outcome. Furthermore, when learning only involves the use of audio-visual, reading, and lecture, students will only remember as much as 20%, 10%, and 5% of the materials respectively. 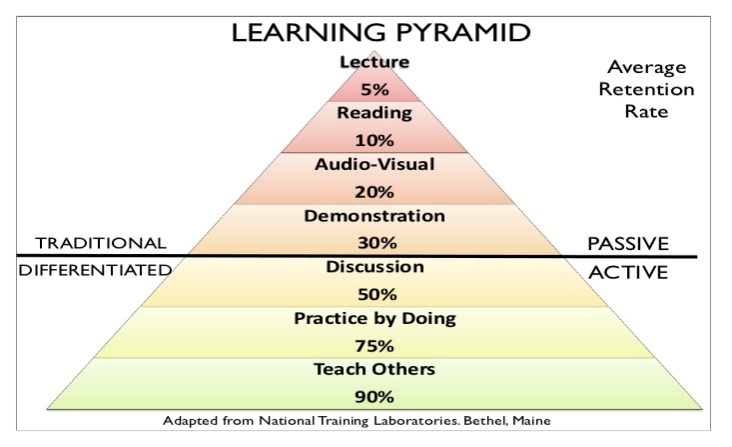 The percentages are far lower than when an active model of learning is used through student discussion, practice, or teaching other students techniques. The lowest percentage of the active learning outcome attainment is when it uses discussion, i.e. 50%. Using practice by doing or teaching others will result in higher percentage of learning outcome, i.e. 75% and 90%. The last method of teaching may be in the form of asking students to explain the information and knowledge that they have learned to a peer-group by exchanging questions, dialogue, discussion, or debate. Therefore, Student-Centered Learning or SCL is highly recommended in order for students to get the most of their learning. Now, what is meant by SCL? From its definition, Student-Centered Learning can be understood as a learning process in which students are the focus of the process. In other definition, SCL sees students as the active participants of the learning activities. SCL is different from Teacher-Centered Learning (TCL) in which the teachers or lecturers are on the main stage of the learning process. A more detailed definition of SCL is provided by Rodolfo P. Ang (2001) from Loyola School Ateneo de Manila University. According to Rodolfo P. Ang, SCL is a model of learning that facilitates studentsâ€™ active participations in the learning process. The active participations may be in the forms of reading text books, reading digital books from the computer, searching for references from online sources, and facilitating students to actively search for certain information and discuss it. In addition to learning from multiple resources, such active learning process allows students to enjoy learning and its process, inside and outside the classroom. Rodolfo added that student-centered learning will take place when both students and the teachers or lecturers actively learn. Students are facilitated to explore the learning materials and to discuss the information they gathered. On the other hand, the teachers or lecturers actively assist the students during the process and encourage students to investigate, discuss, and draw conclusion from their discussion. The need for the lecturers to play an active role in studentsâ€™ learning suggests that SCL does not make lecturers become more relax and reduce their activities. Conversely, SCL requires lecturers to actively read and learn together with their students. In SCL, the relation between students and their lecturers are the relation between junior learners and senior learners. SCL places students as an integral part of academic community. Students are currently regarded as civitas academica, but the status is often not applicable because the lecturers do not treat students as parts of the academic community. Lecturers often see students as the objects of their lecture, and sometimes they are assessed based on their understanding of the lecture. As a part of the academic community, students have the right to perform inquiry, a process of exploration, study, and understanding performed independently by the students. SCL gives students opportunity to perform research and present the research in front of their peer-group and lecturers. Furthermore, lecturers can give inputs about the studentsâ€™ research. By performing such activity, students become a part of the academic community as ideally intended. SCL increases studentsâ€™ motivation to learn by treating them as members of the academic community who have to master theories, apply the theories, and perform continuous study and evaluation of the theories. Besides that, students are also required to present their research to their peers and lecturers. By doing that, students will be motivated to study more outside the classroom which, in turn, will make them become members of learning community. SCL makes students become more independent and more responsible to continue learning. In SCL, students are bound to keep studying because they need to present the result of their learning in front of their peers and lecturers. Therefore, students will have responsibility and independence to study because they will need to keep gathering more information and knowledge to be presented in front of the class every week. The higher number of enrollment to higher education and larger and more varied needs of the market require that students need to broaden the scope of their learning in accordance with the profession they want to pursue after completing their education. SCL gives students opportunity to study things from their field of study independently and differently from what their colleagues study. SCL gives lecturers interesting role in the learning process because the learning material preparation, learning process, and learning conclusion are assigned to the students. Lecturers will need to confirm what students have studied including the conclusion they have drawn. In the meantime, this also gives lecturers opportunity to give challenges to students in order to improve the quality of their learning process and result. SCL offers synergy between learning process and research. 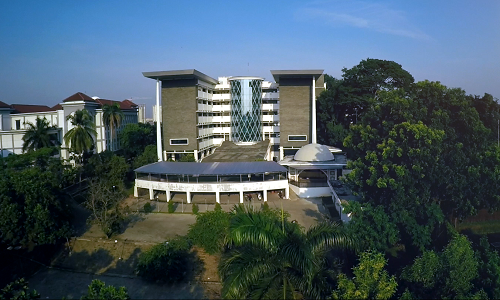 Besides giving lecturers control over studentsâ€™ assignment to reach higher order of thinking skills, SCL enables lecturers to synergize their research with the learning programs (with the students). This will provide dynamic inputs for the lecturersâ€™ research projects. SCL offers sustainable professional development for lecturers. SCL enables lecturers to ask students to regularly update their knowledge about various theories by accessing current academic journals. This will give lecturers inputs for their current research projects. Attard, Angela, et all. 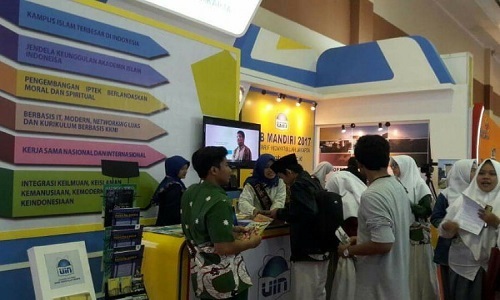 Student Centred Learning, Toolkit for students Staffs, and Higher Education Institution. Education International and the European Student Union, Brussel, Belgia, 2010. Redolfo, P. Ang. Elements of Student Centred Learning. Loyola Schools Loyola Antenoe de Manila Uniersity, Office of Research and Publication, 2001.